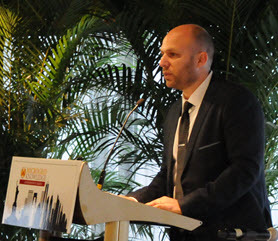 Top NY Prize microgrids show promise of a strong internal rate of return (IRR), according to data released at the Microgrid Knowledge conference in New York last week. The New York State Energy & Research Development Authority is conducting an in-depth analysis of feasibility studies submitted in the first stage of the $40 million competition. Micah Kotch, director of the NY Prize, offered a preview of what the cost-benefit analysis is revealing. Conference participants also received good news on industry growth. In a separate presentation at the conference, Omar Saadeh, GTM Research senior analyst, said that GTM has revised its forecast upward following stronger industry performance in 2015 than expected. 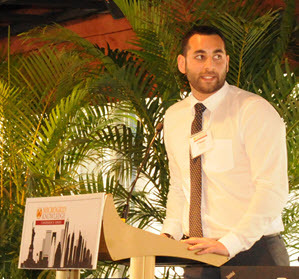 Kotch and Saadeh were among about 25 speakers and panelists at “New York and Beyond: Advancing Microgrids Nationally with Lessons Learned in New York,” a May 19 event, hosted by Microgrid Knowledge in Manhattan. In addition, NYSERDA is finding that several New York Prize microgrids can achieve a positive IRR even without outages factored in, Kotch said. Microgrids avert financial losses that occur when businesses, communities, hospitals and other facilities lose power. So outages help boost microgrid economics, since the microgrid keeps power flowing to the facility when the larger grid fails. But many of the projects required no more than one outage day a year to tip into a positive IRR, according to Kotch. 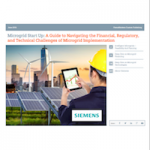 Instead, microgrids increasingly achieve positive returns by stacking revenue streams from price hedging, sale of ancillary services, participation in demand response, sale of renewable energy credits, and other income sources. “What this says to me is that many of these top 10 projects could move forward without NY prize funding. And I’m hopeful some of them will,” Kotch said. Only a handful of NY Prize microgrids are expected to win the final jackpot. State officials all along have described the competition not as a means of sole support for microgrid development, but as a way to seed private sector interest and financing. They have expressed optimism that after getting at least some of the projects through study or early development, the private sector will step in and move them forward. NYSERDA awarded $100,000 in funding to each of 83 community microgrid projects that cleared the first stage. The competition has now entered its second phase, where eight communities will each win $1 million to be applied toward microgrid engineering, design and business plans. In the third and final stage, NYSERDA expects to select a handful of projects, which will each receive $5 million for final build out. The recently completed feasibility studies have created what’s believed to be the single largest data base on microgrid development in the world. NYSERDA intends to roll out a series of reports analyzing the data. The state authority also will make the project feasibility studies available publicly in the coming months within a dedicated page on the NY Prize website. Kotch described the cost benefit analysis as “conservative” and noted that it did not include additional benefits microgrids may accrue as New York advances into its next track of Reforming the Energy Vision. The state Public Service Commission kicked off that track last week by ordering a shift in how utilities make their money. The new model sets up financial incentives to encourage utilities to pursue distributed energy in partnership with competitive players. This could result in new revenue streams for peak shaving, load factor, and other grid system benefits. “You should be able to share in that as a project developer,” Kotch told the more than 160 microgrid industry insiders who attended the Microgrid Knowledge conference. Meanwhile, GTM Research has revised its U.S. growth forecast upward from an expected 2.85 GW of microgrids by 2020 to 3.59 GW, said Saadeh, who presented a second quarter market update, in preparation for GTM’s annual microgrid forecast due out soon. 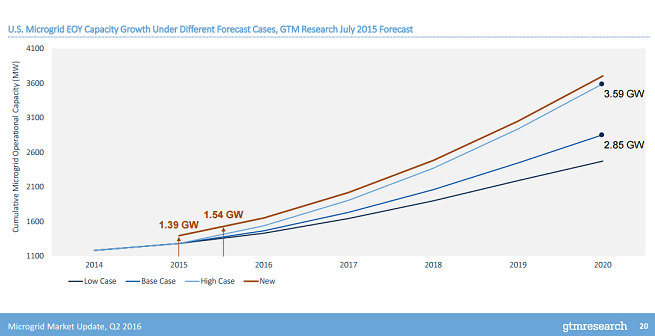 GTM upped its forecast in part because more microgrids came on line last year than was expected. The GTM analysis also found that 70 percent of microgrids (based on capacity) are in seven states. New York is at the top, followed by Texas, California, Georgia, Maryland, Alaska and Oklahoma. The Northeast, one of the most active US microgrid markets for new development, has dedicated about $500 million in state funds to launching the industry, according to Saadeh. Among microgrid fuel sources, fossil fuels dominate, but renewables are catching up at a quick pace. Renewables contributed 6 percent of overall capacity in June 2015, a doubling in one year, according to Saadeh. Saadeh noted that a microgrid’s ability to enhance reliability continues to be the biggest driver for development, especially in the Northeast. But reliability also is the hardest benefit to quantify monetarily. Where do you see the microgrid industry going? Please post your comments below or on our LinkedIn Group, Microgrid Knowledge.